Tea leaves picked in shaded tea fields are steamed and then cooled. As soon as the leaves have cooled off, they are dried at a high temperature. At this point in the process, the leaves still maintain their complete forms with stems and veins attached. The leaves are then cut, and after being dried once more, the stems and veins are sorted out to leave the more tender and more delicious part of the leaves. 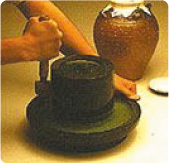 At this stage, the tea is called Tencha which is then stone-ground and made into powdered tea called Maccha. The grinding process requires great care and a considerable length of time. So what do you think of traditional tea practices? 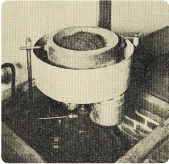 Today, Shohokuen’s factories have the most sophisticated machinery available for tea manufacture. 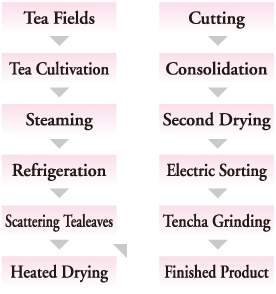 But our tea manufacturer's spirit has remained the same as that of our pioneer family 350 years ago. We are sensitive in dealing with Mother Nature and are grateful for the gifts she brings us. That is why we do not use any food additives or chemicals and strive to exclusively make products that are good for our health.